Any self-respecting cookbook collector will already be familiar with the work of Sally Butcher. She charmingly penned Persia in Peckham, which was a worthy showcase for her wit and expert wordsmithery. That book had its focus on amazing Middle Eastern food of every dietary hue, set against the backdrop of Persepolis, the Aladdin’s cave of an ethnic supermarket that she runs with her family. ‘Persepolis’ sounds like a good name for a restaurant but it’s a deli and store for Middle Eastern ingredients and household goods. I have visited and have been tempted to take up smoking. “Oh, no!” I hear you cry, “Not our clean-living reviewer taking up a hitherto-untried vice?” Well, yes, I have been lured by the coloured glass and nifty pipework of a shisha. Much more stylish than a packet of Woodbines and a box of Swan Vestas. 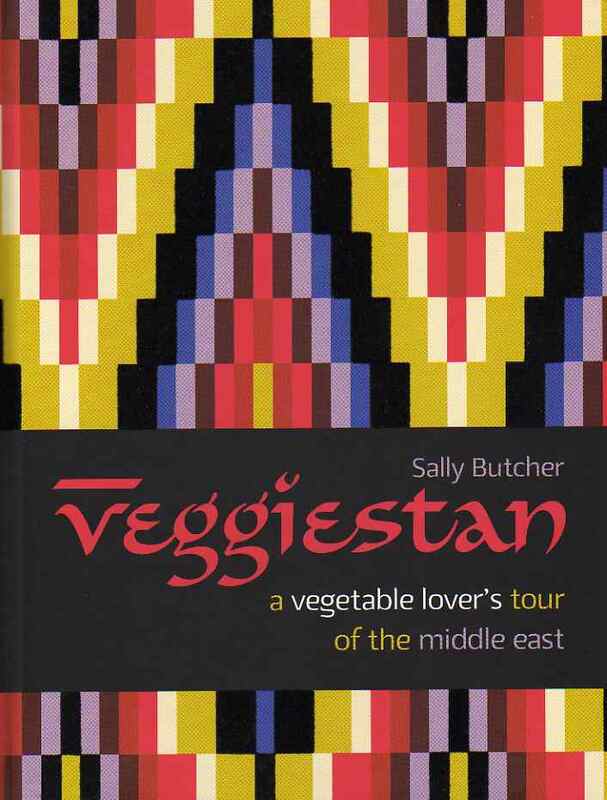 Sally is the lady behind the counter, but she manages to find time between customers to write books reflecting her love of Middle Eastern food. She does that in a convincing fashion as she is not just an interested observer. It’s now part of her cosmopolitan culinary heritage: she cooks these foods on a daily basis for a discerning Iranian husband and extended family. The food is in reality as good as it sounds. I can highly recommend the pumpkin kibbeh which are moist, tender and flavourful. Sally gives credit for the recipe for Tabouleh to the talented and celebrated Anissa Helou (these ladies should open a restaurant together), and it’s a fresh herby salad that has, to be authentic, much more parsley than one might expect. Parsley is a vibrant ingredient when used as the main event rather than an apologetic garnish. Burgers and bacon butties have enticed many a wannabe vegetarian off the meatless wagon. There are plenty of burger vans in Veggiestan, it seems, and they tempt both carnivore and vegetarian citizens with Burghlers. These are veggie burgers that are far more flavourful and a lot healthier than the traditional laden with animal bits. You will find these will become a favourite with the whole family, and there are few meals that can boast that. The ingredients for the dishes are, unsurprisingly, very reasonable. One can buy a big bag of fresh veggies for the price of a couple of steaks. Many people think of them as bland and uninteresting and even “yucky”. Well, that’s a word I would reserve only for Brussels sprouts, but all other vegetables can be made into delicious meals that lack nothing. One can feast on flavour and texture and colour. It is true that one eats with one’s eyes, after all. Sally Butcher has great literary flair. Serious food writing does not have to be dry and academic. Sally is serious about her writing so that makes her, I guess, a serious food writer but the fruits, or in this case veggies, of her labours are humorous. Phrases that encourage a chuckle or two will also persuade those chucklers to actually cook some food. That’s what a good cookbook should do, isn’t it? This is another cracker from a food writer who should be better known and much more appreciated. An ideal Christmas gift, and one of my picks of 2011.